Chances are that you are already using projects and assignments with your students that will easily serve as supporting evidence of their development in learning the language. Have your students written letters, compositions, or even papers that demonstrate their ability to write? Perhaps they have made audio recordings or creative videos that showcase their speaking presentational skills? or have you filmed them engaged in Skype or Zoom conversation with a conversation partner in another country or another school, or a speaker of the language in your community? 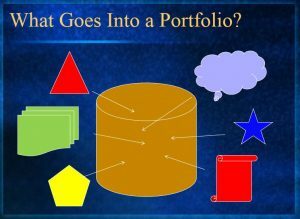 Many different artifacts can go into a portfolio, as we tried to illustrate with our graphic.